February 24, 2006 | Nestled in the southeast corner of Cache Valley is the small community of Avon, where roadside businesses are non-existent and the livestock outnumber the humans. Mike and Kathy Carmichael live along one of Avon's country lanes in the middle of nowhere. The gravel road leading to their home curves down the side of a hill, passes a farmyard full of horses, bumps over a small wooden bridge, and then levels off just before their driveway. Two neighborhood children play in the snow-filled ditch on the edge of their property. At the end of their driveway, a light-colored log home rests on the side of a small hill. The home's garage door is open showing a Siamese cat curled up on a car's roof. This little country haven is where the Carmichaels raise and train their team of Siberian Huskies. The Siberians participate in dog shows and sled races. Mike and Kathy prefer to show only huskies that have raced at least 200 miles. "We want them to be all-round, multi-purpose dogs," said Kathy. Earlier this month, the Siberians ran in the Race to the Sky, a 350-mile dog-sled competition in Montana. Of the 24 teams that raced, they were the 15th team across the finish line. "We hope to someday train a team to run in the Quest," said Mike. Posters from Yukon Quest Race hang on the walls of their living room. "It's one of the harshest races in the world," said Kathy. The 1,000-mile dog sled race stretches through the interior of Alaska and the Canadian Yukon. When the Siberians aren't racing they find rest and company in the Carmichael's kennel, which is currently home to 32 huskies. When entering the kennel, the dogs greet their owners with enthusiastic barking and howling. They soon settle down but continue to watch curiously through the chain-linked fence. The pens line the west side of the kennel and extend half way down the east side. With freshly cleaned cement floors there is only a faint smell of dog. WORKING DOGS: Old Doc, right, gives a good pull to get the sled going. Below, Mike Carmichael hits the trail with his dogs, and Squeaker sits pretty for the camera. / Photos courtesy of the Carmichaels. Each pen contains two to four huskies. Some are young, energetic and seem eager to work; while others are retired and enjoy relaxing. The Siberians each have a name. 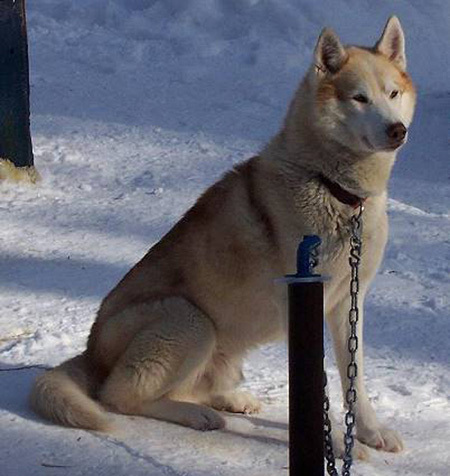 Squeaker is a tall, lean husky with a blonde coat and reddish highlights. He sits quietly along the side of his pen. When Mike says it's time to come out, he jumps up and is thrilled to go outside. Obedient to his owner, he walks down the aisle between the kennels and out the back door. He plays around a bit, stretches and takes care of the normal duties. He responds quickly to Mike's commands and is eager to greet him by jumping up and resting his paws on Mike's chest. Squeaker came from Canada, where he was trained to be a wheel dog. 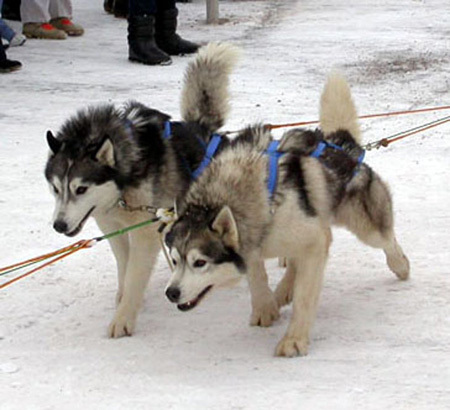 The wheel dogs are harnessed closest to the sled and earn the reputation of being strong and reliable. Squeaker ran the 1,000-mile Iditarod twice with his previous owner. Batiste is one of the two Alaskan Huskies in the Carmichael's kennel. She is an experienced lead dog. When hooked to the sled she has the responsibility of guiding the team, having a keen sense of the trail and responding quickly to her musher's commands. Batiste was the lead dog for Mike in this year's Race to the Sky. 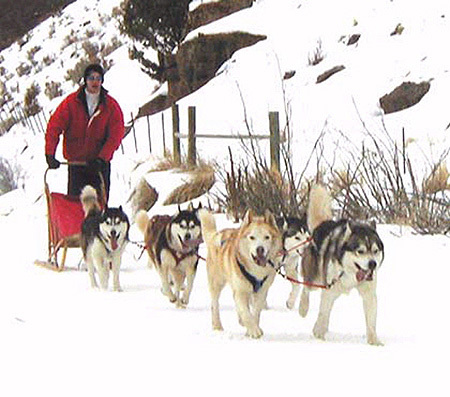 During the initial part of the race each team had a rider in the sled. "I was talking to the rider and wasn't paying close attention when Batiste turned on the trail. I thought we were supposed to go straight but she knew where the other dogs had gone," said Mike. When Batiste retires she will be used to train puppies. "The younger dogs pick up a lot from the older dogs. Like babies, they start mimicking," said Mike. Topaz, another lead dog, wasn't feeling well after 150 miles into a race. Mike zipped her up in the sleigh bag and let Spot take the lead position. "Within a half and hour she gave me the look that said 'What am I doing back here?' So I hooked her back up in Spot's place and she finished the rest of the race," said Mike. There are often distractions along trails. A valued dog is one that won't be sidetracked when the distractions come. During training, when the dog sled team was at a full run they came upon a decomposing deer. Without loosing a beat, Solo grabbed one of the deer's legs and carried it in his mouth as he ran. "It wasn't long (1.5 miles later) before he realized that wasn't such a good idea and dropped the leg," said Mike. The liveliest group in the Carmichael's kennel is the pack of 10-week old puppies. They get their exercise by romping and playing in the pasture. When it is time to come in, Mike calls out, "Here puppies! Here puppies!" He would prefer to call them by name but the five of them are almost identical. "I can tell them apart but it takes more time," said Mike. In a couple of years, the puppies will board the transport truck to go run a race of their own. The truck stands ready with two sleds strapped on the top. This weekend (Feb. 25 and 26) is unique; the truck will be driving to a race without the Siberian Huskies. The Carmichaels are hosting the 2nd Annual Cache Valley K9 Challenge, "two days of exciting dogsled racing in beautiful northern Utah." The races will start on Saturday at 9 a.m. at the Hardware Ranch in Hyrum. It will be a two-day event consisting of races ranging from a 3-mile dash for junior and novice musher, to a 120-mile race for the experienced musher. Twenty-four teams will be racing. Ten have signed up to run in the two-day, 120-mile race. "I hope this race grows each year to become something Cache Valley is proud of," said Mike. At noon on Saturday there will be demonstrations on how dogs and humans can work and play together.